In the past, most dogs were working dogs. Now that we enjoy them mostly for companionship they become frustrated, stressed and bored. Socialization and Training Classes are one of the best ways to help reduce their level of frustration, stress and boredom. Toys can also help to give your dog relief from boredom and relieve stress and frustration. Get some for inside the house and more for the outside play areas. Did you know that your dog becomes bored with their toys very quickly? To give them a large variety of toys will help to enrich their life and increases their level of play helps keep their emotional state balanced. I always advise people to keep an in-box and out-box. That is you split the toys in half to have some that the dogs will have and toys that they have not seen for a while. A box that they are playing with currently and one that holds clean or new toys to keep them for later use. Cleaning the toys before they go to the out-box helps the dog think of them as a new toy. (no scent) The in-box is left for the dog to be able to access throughout the day and picked up at night to allow them to search the box the next day for their toy of choice. The out-box is set aside for a later date. I do this for the outside toys too. Hiding the toys is a fun game to give your dog a search enrichment activity. I also recommend interactive toys that require a person to keep the dog interested in the toy. This toy is a great way to entertain your dog when you’re gone or just want to give your dog a great play time. This toy can be stuffed with a variety things to keep your dog busy and happy. I take a mixing bowl and mix things like Cheese, meat kibble with a spray cheese or peanut butter. Mix well and stuff the toys. Freeze the toy that is stuffed for a ready to give treat when I need it. I always make sure that I buy the toy that the dog can not swallow. I watch them with it the first few time before leaving them alone to be sure that my dogs can not destroy and choke. At Kong Company you’ll find a variety of toys to make any pet a happy pet. Kong toys are 100% safe and 1000% fun to play with! These toys have legendary strength and durable that will last a long time. Choose from a variety of toys and products including: KONGS for cats, puppies, KONG Biscuit Balls, toys for extreme chewers and much more! Looking for a specific legendary Kong toy with its legendary strength? Look no further! 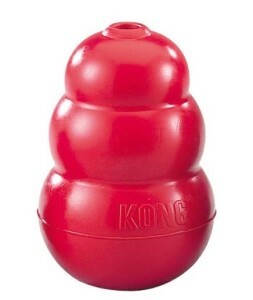 Buy your pet’s favorite KONG toy today! The Tug-A-Jug- Ultimate Interactive Toy! The Tug-A-Jug provides a multi-sensory appeal to keep your dog interested and motivated to play. It stimulates your pet’s sense of sight, smell, hearing, touch, and taste. This makes the Tug-A-Jug the ultimate solution for interactive play. See the treats through the plastic bottle. ~ Scent holes allow the dog to smell the treats. ~ When the Tug-A-Jug rolls, the treats inside rattle. ~ The unique rubber wrap and tight rope serve as chew friendly toys. ~ The sweet taste of victory! Available in two sizes – size small recommended for dogs under 40 lbs and medium/large recommended for dogs over 40 lbs. The Tug-A-Jug is constructed from non-toxic materials, similar to those in making bullet-proof glass! All toys, including chew toys, require supervision at all times. Busy Dog Toys are Treat Dispensing Roll Toys for your dog. Irresistible treat & exercise ball that keeps dogs happy and healthy. This effective and enjoyable dog toy combats boredom and behavior problems. It stimulates dogs both mentally and physically by appealing to their natural instincts… playing and searching for food – making for a happy dog. It’s so easy! Simply put their favorite treats (whatever they may be) into the opening. They can see the treat, smell the treat and hear the treat inside. Give it a roll and enjoy the show. The pet owners have as much fun watching as the dogs do playing. 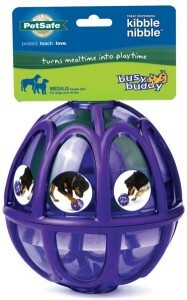 Busy Dog Ball is a Treat Dispensing Roll Toy for your dog. It Curbs Destructive Chewing and rewards your dog for playing with treats, exercise & fun! It’s a challenging toy for starting a puppy, or any age dog, and it makes a great training device. It’s nontoxic, durable and made in the USA. All of it, not just part of it! It’s clear plastic design allows for visibility inside the product, allowing the dog to see their favorite treat. Treats are not restricted to just biscuits, but whatever kind of treat the dog may like. From carrots, apples, cheese, rawhide, etc.